Those willing to do real fundamental research can find companies creating real shareholder value amidst a glut of overvalued and/or poorly run firms. Noise traders create market inefficiency, but they also create opportunity to buy high-quality companies at cheap prices. This firm has continually grown same store sales, improved margins, and shored up its balance sheet, all while investing in the future. It also boasts shareholder-friendly corporate governance practices that align executive interests’ with shareholders’ interests. Despite these positives, the stock remains priced as if profits will never grow from current levels. 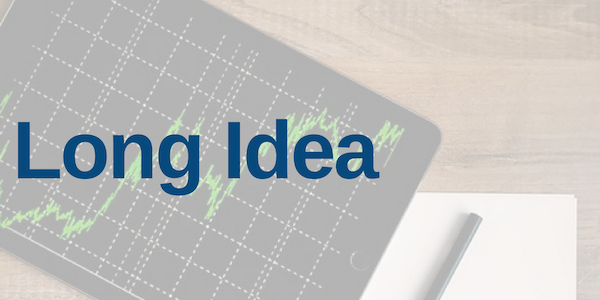 The Children’s Place (PLCE: $130/share) is this week’s Long Idea. 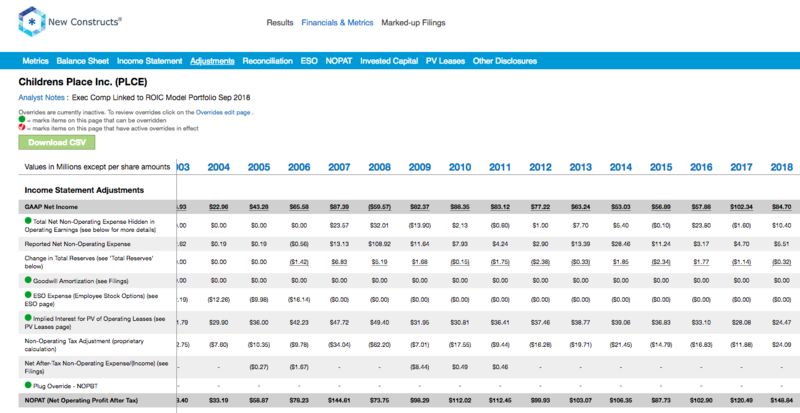 Investors who only analyze reported net income might think that PLCE’s profits have fallen in recent years. On the contrary, our accounting adjustments show that PLCE’s profits continue to rise. In fiscal 2017, the company’s net income included multiple non-operating expenses (some hidden in the MD&A and some reported directly on the income statement) that lowered its reported earnings. As reported on page 35 of PLCE’s fiscal 2017 10-K, operating income includes $10.4 million in legal settlements, foreign exchange penalties, audit settlements, and restructuring charges. On page 70, PLCE reported $37.6 million in one-time taxes on repatriation of foreign earnings along with $5.6 million in taxes due to the reevaluation of deferred tax assets and liabilities. Combined, we removed unusual charges of $66 million, or 78% of PLCE’s reported net income. 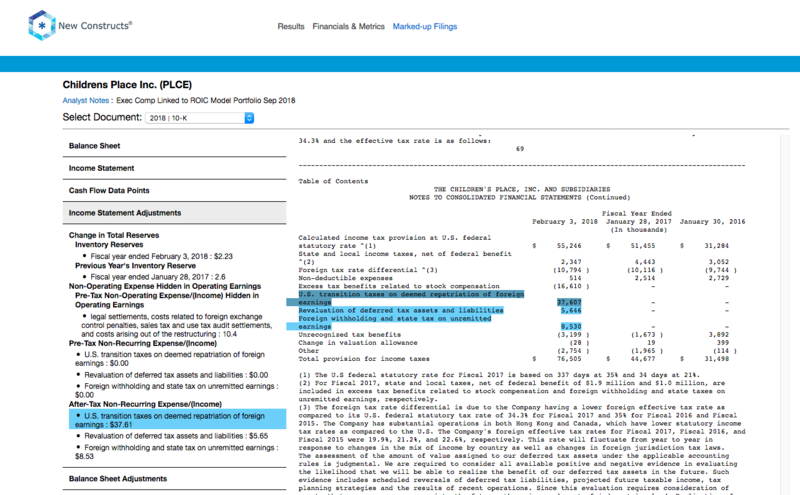 By removing these non-recurring charges, we see that PLCE’s after-tax operating profit (NOPAT) increased 24% year-over-year (YoY) in fiscal 2017 while GAAP net income fell 17% YoY, per Figure 1. Trailing twelve months (TTM) NOPAT sits at $145 million, which, while down from fiscal 2017, is up 9% over the prior TTM period. Over this same time, reported GAAP net income is down 43%. Over the past five years, PLCE has grown NOPAT by 8% compounded annually while GAAP net income grew 6% compounded annually. PLCE’s NOPAT growth has primarily been driven by rising NOPAT margins, which have improved from 5.0% in fiscal 2014 to 7.4% TTM. These high profits and margins helped the firm generate positive free cash flow in nine of the past 10 years and a cumulative $923 million (44% of market cap) in FCF over the past five years. PLCE’s track record of free cash flow is a testament not just to its profitability, but also to its capital efficiency, as we’ll show below. In fiscal 2013, The Children’s Place completed a store review and determined it needed to optimize its store fleet. This fleet optimization plan meant closing stores that underperformed the fleet average and only opening stores that could perform at or above fleet average. The plan aimed to increase the profitability of existing stores as margins had fallen significantly from fiscal 2009 to fiscal 2013. Closing underperforming stores also had an added bonus of improving PLCE’s capital efficiency, an important factor often overlooked by those analyzing GAAP numbers. The Children’s Place has closed 191 stores as of fiscal 2Q18 (with plans to close 300 by 2020), invested capital, total debt, and off-balance sheet operating leases are all lower, and margins have seen ample improvement. The Children’s Place’s invested capital, the amount of cash invested in a company, has fallen from $1.4 billion in fiscal 2013, prior to the store optimization, to $1.1 billion TTM. Net property & equipment has been cut by 17%, total debt is down 26%, and off-balance sheet operating leases are down 37% over the same time. These capital efficiency improvements free up capital to return to shareholders and create a more efficient and competitive operation in a cutthroat retail industry. 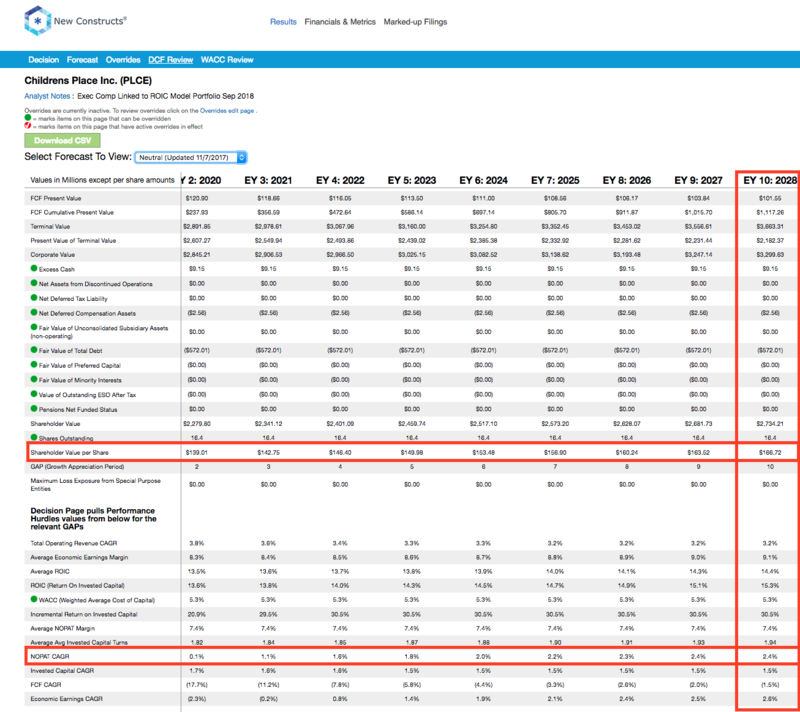 Figure 2 show’s that The Children’s Place’s invested capital turns, or the revenue per dollar invested in its business, have improved each of the past five years and at much faster rates than its peers. Over the past five years, PLCE’s invested capital turns have increased 38% while peers’, which include Carters Inc. (CRI), The Gap (GPS), Kohls Corporation (KSS), Target Corporation (TGT), J.C. Penney (JCP) and more, has increased just 2%. Even better, economic earnings, which take into account cost of capital and changes to the balance sheet, grew 34% YoY in fiscal 2017 and TTM economic earnings are up 2% over the prior TTM period. While improving its balance sheet allows the company to earn more revenue per dollar invested into its business, it still needs to convert that revenue into profits. Since fiscal 2014, The Children’s Place’s NOPAT margins have improved from 5% to 7.4% TTM. Meanwhile, peers’ margins have steadily declined over the same time, per Figure 3. These higher margins are even more impressive as they have been achieved while the company has invested in e-commerce capabilities such as buy-online pick up in store and offer everyday free shipping. Intelligent management enables this brick-and-mortar retailer to compete across different shopping channels. PLCE’s ability to improve its business, ROIC, and create shareholder value is no coincidence. A year after activist investors Barrington Capital and Macellum Advisors won a board seat and a new independent director (2015), The Children’s Place added adjusted ROIC to the metrics it used to determine executive compensation. We’ve previously written on the importance of ROIC to executive performance measurements, and the impact activist investors can have in such a change. Today, adjusted ROIC (weighted at 25%) is used in conjunction with EPS and operating margin expansion to determine long-term performance-based equity awards, which make up 59% of PLCE’s executive pay. Per Figure 4, this change to incentivizing executives with ROIC had an immediate impact on PLCE’s ROIC. Since then, the company’s ROIC has increased from 8% in fiscal 2015 to 13% TTM. We showed at the beginning of this article how accounting distortions have masked the fundamental improvement in PLCE’s business. The company’s excellent corporate governance makes us optimistic that this positive trend will continue. Pundits and talking heads have been calling for the end of traditional retailers for years now with mixed success. In the case of large stores such as Sears Holdings (SHLD) and J.C. Penney (JCP), such analysis has been spot on. However, smaller, more niche retailers have successfully adapted to the e-commerce centric marketplace. PLCE bears will tout other industry failings (Gymboree bankruptcy for instance) as reason to discount The Children’s Place’s future potential. However, not all firms are the same. Some deserved to be put out of business, and others will survive and thrive. This bear case ignores The Children’s Place’s continued same store sales growth, increasing foot traffic, and the success of its e-commerce operations. Per Figure 5, The Children’s Place’s same store retail sales are up year-over-year in 10 of the past 11 quarters and were up 13% in fiscal 2Q18. Most importantly, these same store sales are not simply the result of product price increases, but instead, growing foot traffic to its brick and mortar stores. In fiscal 2Q18, PLCE reported that traffic comps were up YoY in eight of the past nine quarters. To expand upon the growth in its stores, The Children’s Place has also invested heavily in building out a robust omni-channel experience. In 2Q18, the company noted that omni-channel and online customers spend 2.5 times more than retail only customers, so building out this experience is a priority. The company has put in place targeted online marketing, buy online pickup in store, free shipping, and is currently planning to roll out a new pricing/promotional system along with ship to store capabilities in the second half of 2018. These efforts have had great success in ensuring The Children’s Place can reach consumers wherever they’d like to shop. Online sales have grown from 14% of revenue in fiscal 2013 to 26% of revenue in fiscal 2Q18 - on the back of 41% YoY growth in online sales in fiscal 2Q18. The recent tariffs on Chinese goods also have retail industry bears on high alert. Many apparel retailers source their material and/or finished products directly from China and are therefore subject to these tariffs. While The Children’s Place is no different, it has worked over the years to minimize the impact one country has on its supply chain. When current CEO Jane Elfers took over in 2010, 40% of its products were sourced from China. In fiscal 2017, that amount had fallen to 19%, and was “in the mid-teens” in fiscal 2Q18. By the end of 2020, China exposure (on the sourcing side) is expected to be in the single digits. This diversified supply chain helps mitigate any regulatory challenges, such as the new tariffs, while also providing greater flexibility in controlling costs. To that end, The Children’s Place CEO actually expects apparel average unit costs for the first half of 2019 to be down versus the prior year period. Per Figure 6, ROIC explains 73% of the difference in valuation for the 33 Apparel & Accessories Retailers under coverage. PLCE’s stock trades at a slight discount to peers as shown by its position below the trend line. If the stock were to trade at parity with its peer group, it would be worth $143/share – a 10% upside to the current stock price. Given the firm’s improving margins, quality capital allocation, superior corporate governance and e-commerce growth, one would think the stock would garner a premium valuation. Below we’ll use our DCF model to quantify just how high shares could rise assuming conservative profit growth. Despite the strong fundamentals, PLCE remains cheap, even though traditional metrics would show otherwise. At its current price of $130/share, PLCE has a P/E ratio of 30.3, which is above the Consumer Cyclicals sector average of 21.5 and the S&P 500 average of 25. When we analyze the cash flow expectations baked into the stock price though, we find that PLCE is significantly undervalued. At its current price of $130/share, PLCE has a price-to-economic book value (PEBV) ratio of 1.0. This ratio means the market expects PLCE’s NOPAT to never grow from current levels. This expectation seems rather pessimistic given that PLCE has grown NOPAT by 8% compounded annually over the past five years and 13% compounded annually since fiscal 1997. Such pessimistic expectations create large upside potential. If we assume that PLCE can simply maintain TTM NOPAT margins (7%) and grow NOPAT just 2% compounded annually over the next decade, the stock is worth $167/share today – a 28% upside. See the math behind this dynamic DCF scenario. Profit are rising, not falling, due to unusual expenses buried in the accounting results. Impressive balance sheet improvements and capital efficiencies enhance cash flows. Undervalued stock price – PLCE’s P/E ratio looks high relative to the overall market, but as we know, P/E ratios are not a good measure of value. While The Children’s Place has proven its ability to adapt to the retail landscape, the most important question is what will the company do to continue growing profits? Each of the following could provide a continued growth runway and send shares higher. International Growth – China is often considered a lucrative market, but also one of the hardest to enter, due to government regulations and restrictions on foreign owned entities. To help ease its entrance into the market, The Children’s Place has patterned with Semir, which is one of China’s largest children’s clothing retailers. Through this partnership, PLCE expects to open five stores by the end of 2018. PLCE estimates that this partnership will add 300 additional points of distribution and $125-150 million in retail sales in five years. Expansion of Amazon partnership – to help grow its e-commerce business, PLCE sells over 6,000 SKUs on Amazon in its own branded store. In fiscal 2017, the company launched with Amazon Canada for the holiday season. Going forward, PLCE continues to expand its relationship and will be participating in the launch of “Prime Wardrobe”, an Amazon Prime exclusive program that lets consumers try clothing items before they buy, keep what they like, and return the rest. Continue taking market share – one retailer’s struggle can be another’s opportunity. In its 2Q18 conference call, The Children’s Place noted it has seen outperformance in stores co-located in areas that competitor Gymboree has closed stores. With this success, the company is no longer waiting for Gymboree to close stores and is instead actively targeting Gymboree customers. Over time, PLCE believes Gymboree ceding market share could represent a $100 million opportunity. The Children’s Place has increased its dividend in each of the past five years. It’s annualized dividend has grown from $0.53/share in 2015 to $1.60/share in 2018, or 45% compounded annually. The current dividend provides a 1.5% yield. Best of all, The Children’s Place generates the necessary cash flow to continue paying its dividend. Over the past three years, The Children’s Place has generated $687 million (33% of market cap) in free cash flow while paying about $55 million in dividends. In addition to dividends, The Children’s Place returns capital to shareholders through share repurchases. The company currently has ~$307 million remaining under its current repurchase authorization and has bought back, on average, ~$130 million (6.2% of market cap) of stock each of the past three years. When combined with the 1.5% dividend yield, the total yield to shareholders is 7.7%. Insider activity has been minimal over the past 12 months, with 419 thousand shares purchased and 338 thousand shares sold for a net effect of 81 thousand shares purchased. These purchases represent less than 1% of shares outstanding. There are currently 2.9 million shares sold short, which equates to 18% of shares outstanding and 5.7 days to cover. Short interest has increased 1% from the prior month and is down 13% from its 52-week high. Continued improvement in The Children’s Place’s fundamentals could bring about a short squeeze and send shares higher. Income Statement: we made $68 million of adjustments, with a net effect of removing $64 million in non-operating expense (3% of revenue). We removed $2 million in non-operating income and $66 million in non-operating expenses. 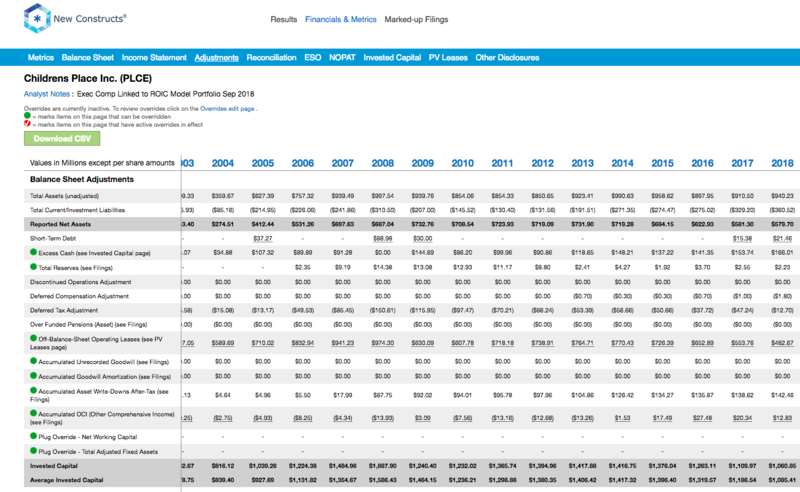 You can see all the adjustments made to PLCE’s income statement here. Balance Sheet: we made $867 million of adjustments to calculate invested capital with a net increase of $506 million. The most notable adjustment was $483 million in operating leases. This adjustment represented 83% of reported net assets. You can see all the adjustments made to PLCE’s balance sheet here. Valuation: we made $584 million of adjustments with a net effect of decreasing shareholder value by $565 million. Apart from $572 million in total debt, which includes the operating leases noted above, the largest adjustment to shareholder value was $9 million in excess cash. This adjustment represents <1% of PLCE’s market cap. The following funds receive our Attractive-or-better rating and allocate significantly to The Children’s Place. Royce Special Equity Fund (RYSEX) – 5.4% allocation and Attractive rating. Arrow QVM Equity Factor ETF (QVM) – 2.3% allocation and Very Attractive rating. America First Tactical Alpha Fund (ABRWX) – 1.9% allocation and Attractive rating. This article originally published on October 3, 2018.